Cook quinoa on the stove top according to package directions using chicken broth. You can also cook your quinoa in a rice cooker, or in an Instant Pot. You need about 3 cups of cooked quinoa. When your quinoa is done cooking, spread it out on a parchment paper lined baking sheet to cool quickly. You can also used leftover chilled quinoa from the fridge. Do not continue with the rest of the recipe until your quinoa has just finished cooking, so that it has time to cool. Heat 1 tablespoon oil in a large non-stick skillet over medium heat. When hot, add chicken breast pieces to the pan in one layer. Let the chicken cook until browning (about 3-4 minutes), and then flip the chicken pieces and cook through (about 3-4 more minutes). Ensure chicken is fully cooked and then remove from the pan and set aside. In a small bowl, add soy sauce, sesame oil, and Sambal Oelek and mix well. Heat 1/2 tablespoon olive or avo oil over medium-high heat in the same pan the chicken was cooked in. Add onion and carrot, and cook until onions are beginning to turn translucent (about 3 minutes), stirring occasionally. Add garlic and ginger, and cook for 30 seconds, stirring constantly, until the garlic is fragrant. Push the cooked veggies to the side of the pan. Add remaining 1/2 tablespoon olive or avo oil, and then add the cooked quinoa to the pan in large spoonfuls. Mix with cooked vegetables in the pan, and then add sauce mixture. Mix well and continue to cook over medium-high heat for about 3 minutes. Reduce heat to low-medium. Create a well in the center of the pan, moving all the quinoa mixture to the sides and exposing the bottom of the pan. Pour whisked eggs into the well. Let the eggs cook for about 1 minute, or until the edges start to bubble, and then mix the eggs into the rest of the quinoa and veggies. Continue to stir until the eggs are cooked and completely mixed into the quinoa. Add peas and return the cooked chicken to the pan. Mix well and continue to cook over low-medium heat for about 2-3 minutes until the peas are heated through. Serve immediately or portion into 4 meal prep containers! Store in the refrigerator and consume with 4 days. 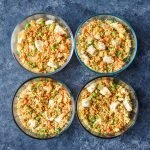 Adapted from Quinoa Fried “Rice” by Cooking for Keeps. Nutrition information estimated with My Fitness Pal.